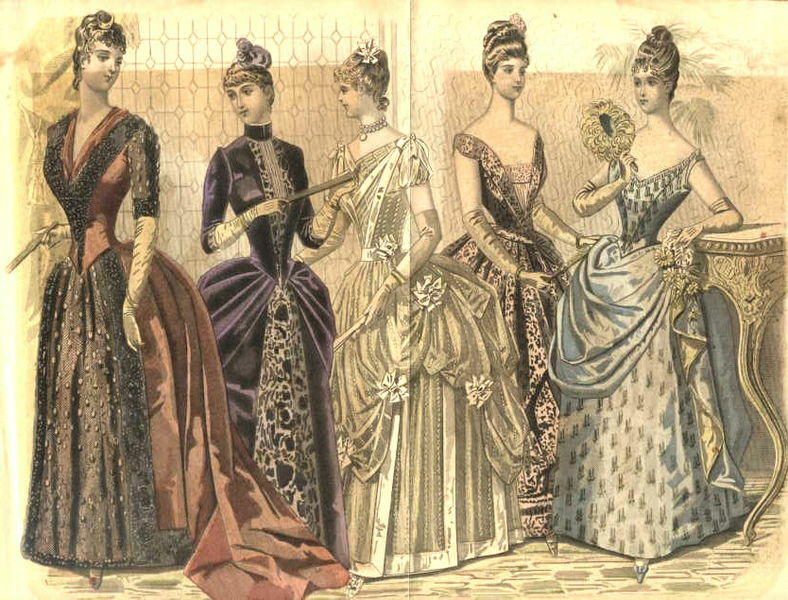 Home » Historical » Edwardian » Are Fashion Plates Accurate? Fashion plates are the first source many historical costumiers turn to for a new outfit. They are easily available online such as on Pinterest, are drawn to showcase clothing in as simple and accessible a way as possible and they very often feature a printed date. Even those that don’t offer a date show so many up to date fashion items that establishing when it was made is rarely difficult. But just how accurate are these supposedly flawless representations that come into every debate? At the simplest level, fashion plates were the catalogues of their day. That is not to confuse them with the modern catwalk that is often fantastical and unobtainable for the general population. Instead think of them as the adverts in a glossy magazine. Before the popularisation of fashion plates in the late 18th Century dolls dressed in the latest fashions were the alternative. The clothes of fashion plates were not the everyday wear of most people in the way you might see a newspaper illustration but that is not to say a lot of people were not wearing them. The plates represented the best of what a seamstress could make based on current trends. So where did those trends come from? The dissemination of fashion would generally begin with paintings of royalty which would create a hunger for those styles among the elite. Simultaneously makers would seize upon that demand and try to sell it to the broader population through these prints in bound editions of ladies’ magazines. This organic process meant elements of aristocratic dress filtered through to the general populace. The era of the fashion plate only ended with the rise of photography when we see the cult of the ‘celebrity outfit’ that lasts to today. So how should we use fashion plates when it comes to costume? Each plate is a snapshot representing the grandest style when in reality most people would add elements to an existing wardrobe. Even the middle classes wouldn’t have commissioned a full outfit every season. The plates very specifically represent the aspirational middle class. Plates as a collection show the history of women’s clothing and the body as hems rise and fall, skirt styles expand and recede and elaborate undergarments style the idealised body. Plates were produced in massive volumes and so offer a fantastic record of designs that were available even if not worn by many people. As a collection they show the progression from made-to-order to more off-the-peg styles taking over. Overall this means that recreating a specific fashion plate is problematic, although a very good and fulfilling exercise in researching a garment and making it from scratch. There is a whole array of considerations when attempting to make an outfit straight from a fashion plate – like the fact that these models are shaped like unrealistic fashion mannequins and even then we are not the same shape as our ancestors. The real use of fashion plates is arguably to justify the existence of a specific garment at a specific time and in rare cases this can be used to date original items. Perhaps the more authentic project to undertake is to find a collection of prints and make an element of each to create an outfit representing several different years in one. An End to Victorian Eroticism?